In my current project I'm using a DS18B20, which seems to be the only temperature sensor to show up when googling for waterproof temperature sensor for an arduino. The sensor itself is fine, however, I'm outputting the sensor's data to a SPI screen, and whenever the sensor is called to read data I believe the SPI communication is interrupted because of 1-Wire, and you can see a white flicker on the screen. The background LED is flashing more brightly for one frame. It's almost unnoticeable, but it bothers me. I also tried a function where I'm constantly calling the sensor and only drawing on the screen if there's a change in temperature, but then the screen is flickering all the time. Thus I conclude that the flickering is caused by the actual calling of the sensor, and not from redrawing anything on the screen. So I'm wondering if there's an alternative to the DS18B20 that communicates via SPI, and that I can use in an aquarium, so I don't have to use both protocols in my project. 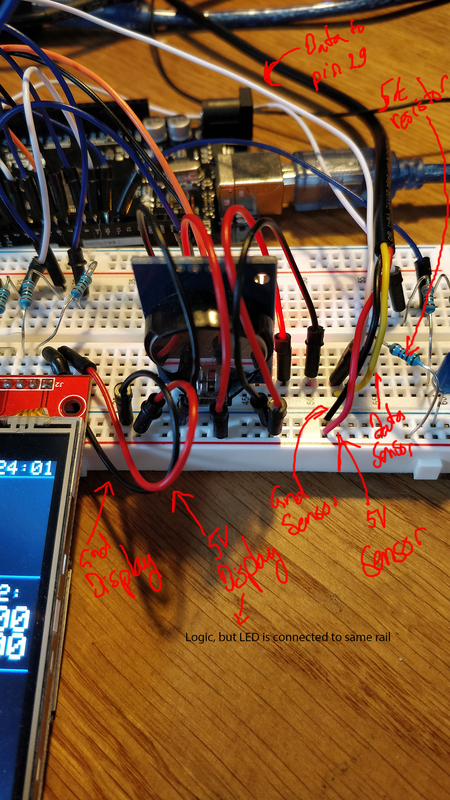 The screen is wired to the ICSP headers on my Arduino Mega 2560 and power is supplied via 5V on a powersupply that is connected to my breadboard. The DS18B20 is wired to pin 29 on the Arduino and is also supplied with power via 5V on the same powersupply. There is a delay in the DallasTemperature requestTemperatures() function - it blocks until the temperature conversion is complete unless you have previously called setWaitForConversion(FALSE). If you did that, you would still have to wait for the conversion but you can do it an a non-blocking manner, and I don't see that happening in your code. Not the answer you're looking for? Browse other questions tagged arduino-mega sensors i2c spi temperature-sensor or ask your own question. Why do my temperature sensor values become inconsistent when additional hardware is added to the board?